A team of historians and archaeologists plan to use radar to find out whether tunnels beneath a Nottinghamshire marketplace exist. 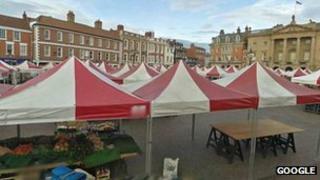 Newark and Sherwood District Council said the tunnels are rumoured to run beneath the marketplace in Newark but have never been investigated. The council is funding the initial work, which will cost between two and three thousand pounds. Historians hope that if found, the tunnels could be a tourist attraction. Historian Jim Wishart said: "We know there are voids beneath the marketplace because there have been small collapses at various times. "The investigation is about the significance of those voids and how they join together. They could possibly link the castle, the church and the old chantry." He said the two-month study would use ground-penetrating radar, which generates computer images of what lies underground. Trent & Peak, an archaeological charity which mapped Nottingham's caves, has agreed to do the work. If the first investigation is successful, the council will approach the Heritage Lottery Fund for money to continue the work. The investigation was prompted by a planning application from Newark Town Council to erect temporary posts for Christmas lights in the marketplace. The district council, which owns the square, widened its feasibility study of the application into an investigation of the rumoured tunnels. A spokesperson said: "Everybody who grew up in Newark knows the legend of these tunnels. It's part of local folklore."